Take advantage of the waves! There are a number of excellent offshore spots along the Ligurian coast that will make riding the Mediterranean an experience to remember. In the spring, autumn and winter, the good weather conditions along the Ligurian coast even allow kite and wind surfing. Imperia is a key surfing centre, offering lots of great spots in the surrounding region, Oneglia for example, or Spiaggia d’Oro in Porto Maurizio. Especially in the pre and post-season, Liguria’s beaches afford lots of space for kite surfing. Thanks to the perfect wind conditions, there is nothing to stop you from enjoying an exciting surfing excursion. 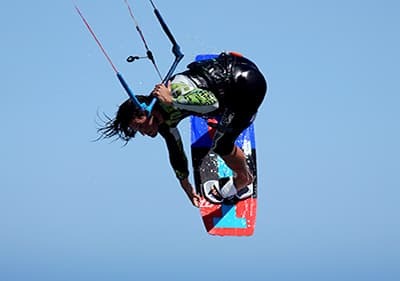 The most popular areas for kite surfing are Porto Maurizio in the bay of Spiaggia d’Oro, as well as the bays of San Remo or Diano Marina. 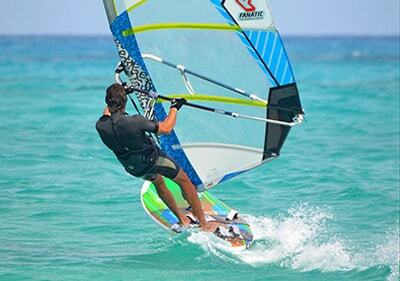 The best beaches for wind surfing are Alassio and Pietra Ligure. 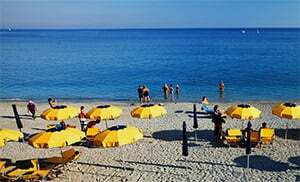 They provide the perfect wind conditions and are less crowded than other popular beaches, such as the beach of Varrazze. Beginners are better off at the beach of San Remo, as the waves produced in this bay are softer and therefore easier to handle. The characteristics of Liguria’s coastline offer the best conditions for surfing all year round. Many surfers prefer the bay of Spiaggia d’Oro, or the bays of Diano Marina and just before San Remo. If you have your own equipment, you can just dive in and get started. If you don’t, you can get in touch with one of the surf stations and hire equipment. Equipment can be hired for the day or even the entire month - you decide, what suits you best. Starting in June, beginner courses for children (6-11 yrs. old) and youths (12 - 17 yrs. old). The courses are in groups of 5 or 6 people and are held for 5 or 6 days. Rental of life jackets and boards is available, but only in conjuction with a course.